Been play with guns since school days, now got into airsoft and have a good time. Met some crazy people and some very good shooters. Hoping to get to a few sites and have some good games. Skirmish in Nottingham you say? 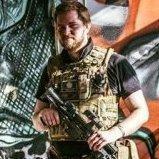 Is that the actual site - Skirmish Airsoft, just outside Notts, near Mansfield? 'Cos that's my site! Welcome to the forums, I might see you down there some day. You going this weekend for Big Sunday?